KSP Investigates Officer Involved Shooting in Oldham Co.
KSP will be conducting a news conference at a time to be determined in regards to this investigation. Crestwood, Ky. (Feb. 11. 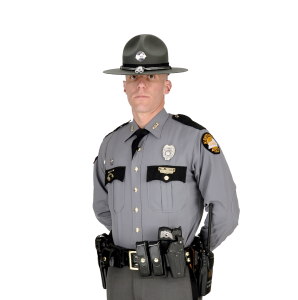 2019) — On February 11, 2019, at approximately 3:24 p.m., Kentucky State Police Post 5 dispatch was contacted by Gallatin County dispatch in reference to a 911 call from a witness, stating they observed a distressed female at a gas station that was forced into a vehicle by a male. The caller stated it appeared that the female was asking for help and that the vehicle then sped off traveling towards Interstate 71 Southbound. Troopers from Post 5 were dispatched to attempt to locate the vehicle, which was described as a dark colored Dodge Caravan with a Quebec registration plate. Troopers observed a vehicle traveling southbound in Henry County that closely matched the description provided. A traffic stop was initiated near the 34 mile-marker southbound by a responding trooper when the vehicle failed to yield, continuing southbound without stopping. The pursuit continued into neighboring Oldham County with the operator of the vehicle continuing to evade and failing to stop. Responding Troopers attempted to use stop sticks at approximately the 22 mile marker southbound. The stop sticks were unsuccessful due to the suspect evading their deployment. The pursuit continued southbound on I-71 with the suspect continuing to evade responding units. Once the pursuit entered Oldham County, KSP troopers were joined by the Oldham County Police Department and the Oldham County Sheriff’s Office. Units from these agencies, as well as other responding Troopers, positioned themselves at the Exit 14 (Pee Wee Valley/Crestwood) ramp. The suspect exited the interstate at the Pee Wee Valley ramp where he then crossed Highway 329 attempting to reenter the interstate. Due to public safety concerns, the primary KSP pursuit unit performed a legal intervention stop to prevent the suspect’s vehicle from re-entering the highway. After the vehicle came to rest on the ramp, the trooper attempted to apprehend the suspect. While attempting to apprehend the suspect the trooper heard a gunshot coming from within the vehicle which he perceived as an immediate deadly threat to himself and the female passenger. The trooper drew his service weapon and fired at which time the suspect was struck resulting in his death at the scene. During this event, the female passenger was struck by at least one round of gunfire. The female was transported by Oldham County EMS to the University of Louisville Hospital where she was pronounced deceased by the Jefferson County Coroner. The male suspect was identified as Ty’rell Pounds (24) of Mansfield, OH. The female victim was identified as Skylar Williams (20) also of Mansfield, OH. In cooperation with Ohio authorities, it has been confirmed that Ty’rell Pounds was the suspect in the Mansfield Ohio abduction of Skylar Williams. KSP will be conducting a press conference in regards to this incident.